Playwright, librettist, screenwriter David Henry Hwang on Flower Drum Song: ""It's really part of the fabric of having grown up as an Asian American baby boomer,"" he told the Los Angeles Times. ""It sort of cast a long shadow over our lives, because there weren't many images of Asian Americans in the media, and those that we saw tended to be foreign or evil...Flower Drum Song had some Asians that seemed like regular Americans. And it was goofy and naive and sentimental, but positive...I wanted to have a conversation with it."" The result of that ""conversation,"" five years in the making, is a brand-new production of FLOWER DRUM SONG. Not a revival, and not a wholly new musical, it is something else altogether: a >David Henry Hwang original joined with a Rodgers & Hammerstein standard. ""It is unlikely that such a radical 'revision' has ever been done to a classic American musical,"" reported Performing Arts Magazine. ""Indeed, the new Flower Drum Song is an unusually ambitious aesthetic experiment: an attempt not merely to revise the book of an established musical, but to use its score, its songs, music and lyrics, to tell a new, different story while remaining true to the values, aesthetic and moral, of the original. This is not an exercise in deconstruction, campy irony, or self-conscious revisionism,"" it continued. ""This Flower Drum Song is intended to be an integrated and complete musical drama and, dare one say it, a sincere attempt by major contemporary theatre artists to collaborate with giants of the past."" The ""new"" Flower Drum Song had its world premiere at the Mark Taper Forum (Gordon Davidson, Artistic Director) in Los Angeles in October. Directed and choreographed by Robert Longbottom, with musical direction by David Chase, it was greeted with unanimous rave reviews; the limited run quickly sold out, it was extended into 2002, and talk of the future arose immediately. ""Broadway,"" wrote Time Magazine, ""get ready!"" Flower Drum Song has always held a unique place among the R&H musicals. Coming late in their career after two consecutive, and rare, Broadway flops (Me and Juliet and Pipe Dream) and one hugely successful television musical (Cinderella) it once held its own against mega-popular hits like Oklahoma! and The King and I. However, as fashions changed, so did its fortunes. ""Oscar Hammerstein referred to it as their 'lucky hit,""' R&H President Ted Chapin told the Los Angeles Times. ""Unlike the rest of the canon, it didn't live on with the same kind of force as some of their other musicals."" The original production, though, was a hit indeed, running for 600 performances, making stars of its leads Miyoshi Umeki and Pat Suzuki (landing them on the cover of Time the first Asian Americans to do so), launching a London production, a U.S. National tour and becoming one of R&H's strongest titles in the summer stock (and Vegas) circuits of the early '60s. A 1961 movie version, starring Umeki, Nancy Kwan, James Shigeta and Jack Soo, was also a huge hit with profound implications for Asian Americans. ""Flower Drum Song represented a real breakthrough for our parents,"" Hwang told Performing Arts. ""It portrayed a Chinese American family that was 100% American, and characters who didn't all speak in accents, who were sympathetic and had romantic relationships which, by the way, we still don't see much in movies today."" In a 1996 appraisal for lnside Asian America, journalist Yuan-Kwan Chan observed: ""It was the first and so far, the last film by a major U.S. studio in which Asians or Pacific Islanders play all the major roles Revolutionary for its time, it continues to be so in ours. "" In Los Angeles Magazine, Nancy Kwan recalled, ""This was the first big movie about Asian Americans. They spent money on sets, costumes, dance numbers, and they made money. That all said something important."" Nevertheless, by the time Hwang was a student at Stanford University in the late '70s, attitudes towards Flower Drum Song including his own had changed. ""We were deep into issues of identity politics,"" he recalled in an interview with the Daily Breeze. ""We were so politically correct, I think I felt a need to demonize Flower Drum Song on principle."" In Performing Arts, he elaborated: ""In retrospect, I think the protest was probably necessary. Asian Americans were beginning to write about themselves. We felt a need to repudiate the way non-Asians had written about us. Which meant repudiating Flower Drum Song. ""But even back then people would, in private, admit that they liked the show. How could they not? For us boomers, it was our first opportunity as kids to see Asian Americans singing and dancing in a Broadway play and Hollywood musical...As a kid I had liked it. As a young man I rejected it. Now I'm trying to reconcile that and find some middle ground."" 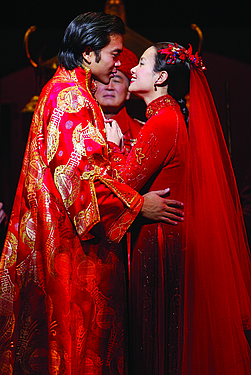 That reconciliation began in Siam specifically, the Siam depicted in the 1996 Tony-winning Broadway revival of The King and I. ""I really enjoyed it,"" Hwang told the started thinking of other Rodgers and Hammerstein musicals that I'd like to see again, and that led to Flower Drum Song."" He added, ""I knew there was a lot to like and a lot not to like."" Revisiting Flower Drum Song, he thought, would provide him with ""a wonderful opportunity to collaborate with two of the greatest artists of this century,"" as he told Playbill. ""It would be fun to create a new musical using the wonderful score that had been written for the original."" In 1996, Hwang met with Ted Chapin, Mary Rodgers and the late James Hammerstein to make his case. (Jamie had been a stage manager on the original Broadway show and subsequently directed several productions of Flower Drum Song.) 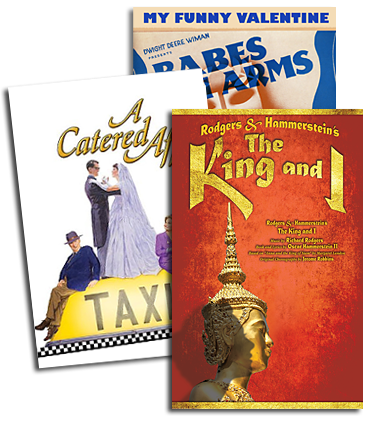 At that meeting, Hwang recalled, ""I told them I wanted to remain true to the show's original sensibility and themes, its sense of cockeyed optimism, while giving it more of the dramatic weight the great Rodgers and Hammerstein musicals have. I wanted to write the book that Oscar Hammerstein would have written if he'd been Asian American. Instead of being a tourist's-eye view of Chinatown, I wanted to write it from the point of view of the inside looking out."" The rights holders (including Ralph Fields, the son of co-librettist Joseph Fields) liked what they heard from Hwang and decided to say yes unambiguously. ""We went into it understanding that if we were going to go ahead with this experiment,"" Chapin told the Los Angeles Times, ""we had to be open to it."" After an early draft that was, in Chapin's words, ""totally unproduceable,"" Hwang hit his stride with a script he developed in tandem with Robert Longbottom and David Chase. A new musical began to emerge one that stayed true to the basic settings and principal characters of Flower Drum Song, while rearranging those characters and their situations into an almost entirely new plot, an amalgam of Hammerstein, Fields, the original novelist C.Y. Lee, and Hwang himself. Its theme, one that runs through much of Hwang's work, is assimilation. ""The issue of assimilation hasn't dated,"" Chapin told American Theatre. ""In fact it's very universal. What's dated is the idea that the height of being American is getting a Thunderbird and a TV set, which is partly what the original show conveyed. Today when you come to America, it's important to hold on to some of what you brought with you, and David wanted to look into that."" Vital to this re-telling was the score, kept almost intact. (Two songs were cut and one, ""My Best Love,"" was restored. One other number, ""The Next Time It Happens"" from Pipe Dream, was interpolated.) ""I like our demonic reputation of not wanting to change anything,"" Chapin told Performing Arts. ""It's a good reputation to have because then, when someone like David comes along with a proposal, we can really surprise people We've allowed more wholesale revisions than we might with any other show,"" he added, ""because this show may be more caught in its time than Rodgers and Hammerstein's other works."" Nevertheless, ""there is always a core of people on fringes who are not going to be happy with this,"" Hwang freely admitted to the Los Angeles Times. ""There is a core of R&H fans that are going to be offended by the idea of rewriting it at all, and a core of Asian Americans that remain offended by the musical and therefore the idea of doing it again."" In fact, even prior to its first public performance, one angry letter writer to the San Francisco Chronicle complained: ""That David Henry Hwang had the audacity to approach the Rodgers and Hammerstein estates and request permission to rewrite it is overshadowed only by the estate's puzzling willingness to allow him to do so."" ""I didn't sit down thinking, 'I need to fix the old Flower Drum Song,""' Hwang told American Theatre. ""I thought, here's an opportunity to tell a story about assimilation and immigration, but do it in collaboration with Rodgers and Hammerstein, who created this wonderful score around those themes. It meant working with great music that already existed, and trying to make that music flower around a story that would thematically bear out some of their own initial ideas."" With a cast led by Lea Salonga as Mei-Li, Jose Llana as Ta, Tzi Ma as Wang, Sandra Allen as Linda Low and Jodi Long as Madame Liang, Flower Drum Song opened at the Mark Taper Forum on October 12. ""Wholly revised and gleefully self-aware,"" wrote the Los Angeles Times, ""it's a raffishly entertaining response to the 1958 original."" Entertainment Weekly said it was ""wildly entertaining,"" Variety called it ""a bold theatrical operation, an artistic success,"" and Backstage said it was ""the most exhilarating musical show we've seen all year."" David Henry Hwang, on the new Flower Drum Song: ""It's been a process of telling my story in collaboration with Rodgers and Hammerstein, "" he told Performing Arts. ""Directors constantly get to collaborate with past masters. Writers don't. This is very exciting."" Flower Drum Song completed its SRO engagement at the Mark Taper Forum in Jan uary...lt will open on Broadway in Fall 2002, presented by Benjamin Mordecai, Michael Jenkins and the Center Theatre Group (Gordon Davidson, Artistic Director).